The new video ads will be mixed into your news feed along with content from your friends on both the desktop and mobile versions of the site. Video will begin playing as you scroll by, though no sound will play unless you click or tap on it. The good news is that the mobile ads won’t eat up your data plan – video will only be downloaded when your phone is connected to WiFi. For now, the only such ad currently on Facebook is for the upcoming Summit Entertainment film Divergent, and it’s likely only a handful of targeted users of the social network will ever see it. Should the new format prove as successful and lucrative as hoped, you can expect to see a much wider rollout of ads in the coming months. As reported here on Techlicious, Facebook unveiled auto-playing videos back in September, ostensibly as a way for “individuals, musicians, and bands” to better engage their Facebook followers. Of course, much of that work was to prepare for this, the launch of auto-playing video ads. And indeed, these ads could prove to be big business for the social network: The Wall Street Journal reported back then that the going rate for a series of three 15-second video ads on the site could be as high as $2 million. 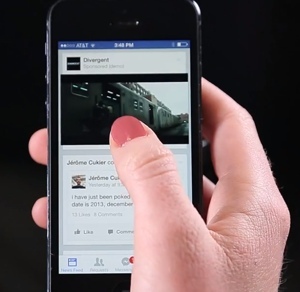 For more on the new video ads, check out the Facebook for Business blog.